Amazon's U.S. e-commerce business grew about as fast as Walmart's last quarter, despite being an order of magnitude larger. As Walmart (WMT - Get Report) shares tumble thanks to the weaker-than-expected U.S. e-commerce growth disclosed in the company's latest earnings report, the big question isn't whether Amazon.com's (AMZN - Get Report) local e-commerce dominance remains unchallenged (it clearly does). Instead the key question is what the long-term implications of this dominance are, as the competitive strengths that have allowed Amazon to steadily take share keep compounding. Though Walmart beat January quarter sales estimates and reported better-than-expected U.S. comparable sales growth, gross margin pressures led it to miss EPS estimates and guide for fiscal 2019 (ends in Jan. 2019) EPS of $4.75 to $5.00, mostly below a $4.99 consensus. Just as importantly, the retail giant reported that its U.S. e-commerce sales and gross merchandise volume (GMV), respectively, grew 23% and 24% on an annual basis, below expectations and much slower than the 50% and 54% recorded in the October quarter. As usual, Walmart didn't give any quarterly e-commerce sales figures. But CFO Brett Higgs did say on the earnings call that Walmart's fiscal 2018 U.S. e-commerce sales were close to prior guidance of $11.5 billion. Walmart's shares, which had popped following the company's October quarter report and were up about 50% over the prior 12 months going into earnings, fell about 10% to $94.11 on Tuesday. Amazon's shares, meanwhile, rose 1.4% to $1,468.35, and are once more close to a recent high of $1,498.00. Nonetheless, considering how much smaller Walmart's e-commerce operations remain relative to Amazon's, and how much it previously stressed the improved e-commerce seen in prior quarters was driven in large part by Walmart-branded sites rather than Jet.com, the latest numbers are naturally producing a lot of second-guessing. Last year, eMarketer estimated Walmart would account for 3.6% of 2017 U.S. e-commerce GMV. That's up from 2.8% in 2016, but a fraction of Amazon's estimated 43.5% share, and also below eBay's (EBAY - Get Report) estimated 6.8% share. In addition, much of Walmart's recent e-commerce growth appears to stem from orders that end up being picked up at Walmart stores, and may have otherwise been placed there. Research firm Slice estimates the Walmart Grocery service, which provides free in-store pickup for online orders, accounted for 26% of Walmart's June U.S. online sales. The firm also estimates that Jet.com accounted for less than 10%. On the call, CEO Doug McMillon partly blamed the e-commerce slowdown on "operational challenges." When pressed on the issue, he said seasonal inventory spikes for items that are popular during the holiday season (electronics, toys, etc.) hurt Walmart's ability to sell "more everyday items." He insisted the company is learning from the experience. When asked about what makes Walmart confident it can see 40% fiscal 2019 U.S. online growth, McMillon cited the expansion of Walmart Grocery -- "[W]e're going to almost double the number of locations that do online grocery," he said. -- along with ongoing investments in Walmart.com and Jet.com. For Walmart.com, those investments include deploying Jet's Smart Cart tech, which uses an algorithm to lower item prices based on factors such as order size, shipping distance and a willingness to forgo returns, as well as efforts to "bring in new brands" that were previously averse to selling on Walmart's main site. 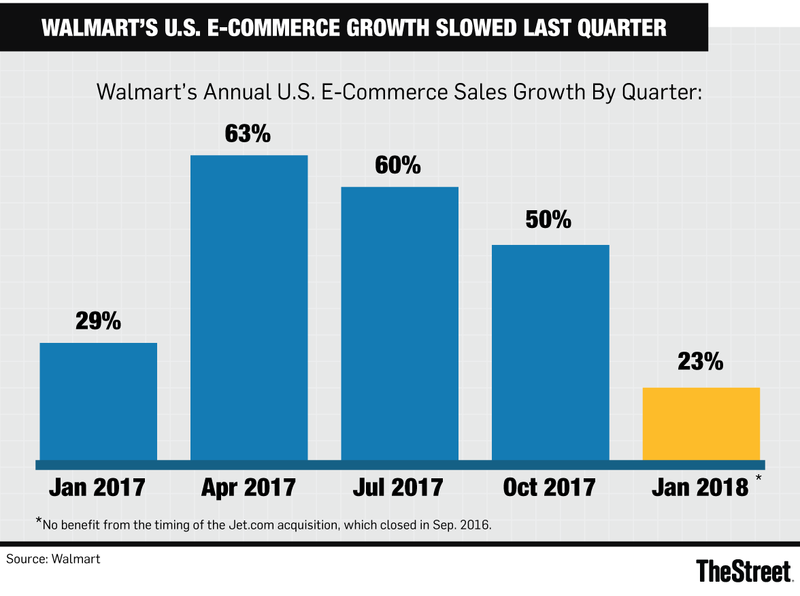 McMillon did caution, however, that Walmart doesn't expect to see 40% U.S. e-commerce growth in the April quarter. He also forecast Jet.com, pivotal to Walmart's efforts to sell to higher-income consumers and Millennials (demographic groups in love with Amazon Prime), "will not grow as quickly as it did in the early days," as Walmart lowers its marketing investments for the platform. Walmart's disclosures come a couple weeks after Amazon reported its North American e-commerce segments posted Q4 revenue of $37.3 billion. After backing out Whole Foods' bricks-and-mortar revenue, the segment grew about 25%, down a bit from Q3's 28% but (in spite of Amazon's huge share) well above the 16.8% Q4 growth the Commerce Department estimates for U.S. e-commerce overall. Based on Amazon and the Commerce Department's numbers, Internet Retailer believes Amazon single-handedly accounted for 70.2% of 2017 U.S. online retail growth of $62.5 billion. As well as 34.7% of total U.S. retail growth of $126.5 billion. There's little to reason to doubt that share gains will continue, as Amazon's proverbial flywheel of sales growth, Prime sign-ups and renewals, third-party seller growth and warehouse/logistics investments keeps humming along. Especially given the degree to which many Prime members often shop on Amazon without bothering to look at other sites -- particularly for the kind of "everyday" items that Walmart recorded disappointing January quarter growth for. It's also worth wondering if some of Amazon's recent moves to grow sales to non-Prime members and lower-income consumers stole a bit of Walmart's thunder. These moves have included lowering the free shipping minimum for non-Prime orders back to $25, and offering discounted Prime subscriptions to U.S. consumers relying on food stamps or other government-assistance programs. And going forward, Amazon's efforts to integrate Whole Foods could weigh on Walmart's grocery sales. These efforts include free shipping (via the Prime Now rapid-delivery service) on $35-plus Whole Foods orders, a just-introduced 5% discount on Whole Foods purchases made with the Prime credit card and plans to make Prime Whole Foods' loyalty program. That said, the demographic differences between Whole Foods and Walmart's customer bases will probably limit the damage. Last quarter, Jeff Bezos' company saw 20% global direct e-commerce growth, 41% third-party seller services growth and (thanks to Prime) 49% subscription services revenue growth. It also upped its fulfillment spend by 57% to $9 billion, and grew its capital investments (not counting capital leases, which are driven more by AWS than retail) by 50% to $3.6 billion. All that sales volume and warehouse growth serves to further increase the scale advantage Amazon has relative to online retail peers, and also helps it lower its shipping costs by steadily cutting the average distance an order needs to travel. It also provides the groundwork for expanding into fields such as rapid food delivery and high-volume business e-commerce services. Throw in the continued expansion of Amazon's seller base and a reputation for top-notch customer service, and the company's flywheel stands to put more and more pressure on smaller e-commerce peers in the years to come. Many will undoubtedly decide to focus on niche markets where they feel they can differentiate, rather than challenge Amazon head-on. It's also possible that greater regulatory scrutiny could one day throw a wrench into the steady expansion of Amazon's e-commerce empire. But don't count on Walmart or another smaller rival to do so.